The prospect of another cat stalking the corridors of Downing Street may have receded after David Cameron said he had "no plans" for pets if elected. The Tory leader told Absolute Radio he expected his children to start asking him for gerbils and hamsters but he hoped to resist this for some time. His comments came after it emerged that Alistair Darling's cat Sybil, which lived in No 11 for a while, had died. Predecessor Humphrey lived there for years after arriving in 1989. Asked whether he would follow President Obama, whose plan for a "first puppy" in the White House attracted worldwide attention, Mr Cameron said this was unlikely. As his children were still young, he said he felt the time for pets was some way off. Downing Street has a long tradition of feline mouse-catchers. 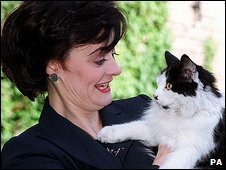 Mr Darling's cat Sybil moved into the chancellor's flat from the Darling family home in Edinburgh in 2007 but left six months later after failing to settle. She was named after the fictional hotelier Basil Fawlty's wife in the 1970s comedy show Fawlty Towers. Amid rumours that Gordon Brown disliked the cat, his official spokesman was forced to say that the prime minister did not have a "problem" with the animal. Sybil's predecessor Humphrey wandered around Downing Street for years after first arriving in 1989. But he moved out just six months after Tony Blair became prime minister in 1997.